Solution: I am having trouble redeeming my code. 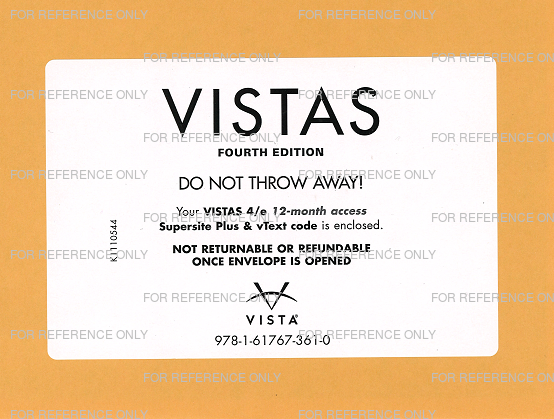 INSIDE NEW TEXTBOOK: A code card or envelope containing a code will be found inside your new Vista Higher Learning textbook or textbook package. Codes can be a combination of six or twelve capital letters. Your code will look like one of the following examples. Card Sample: Your code may be printed on a card that requires you to reveal the code by scratching off a silver protective coating. NOTE: Carefully scratch off the silver coating. Code Envelope Samples: Your code sheet may be in a sealed envelope that is included in your shrink-wrapped textbook or textbook package. 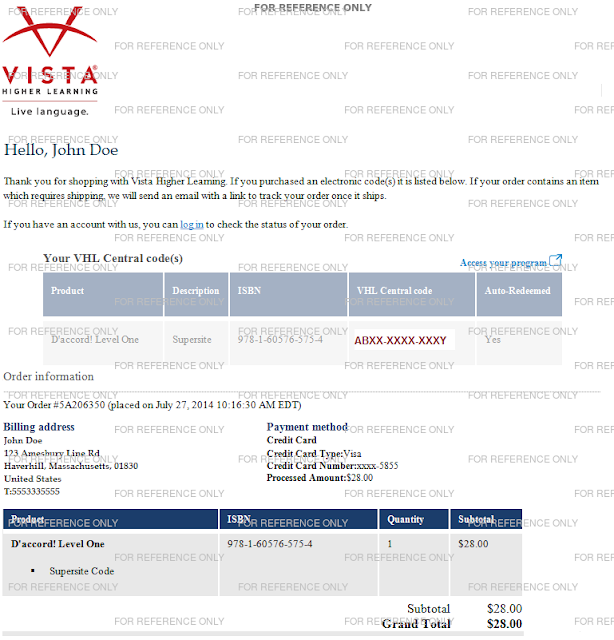 E-DELIVERED: If you purchased a code via the Vista Higher Learning online Store, your code appears on the confirmation screen when you complete your order, and is also included in your order confirmation email. Confirmation Email Sample: Confirmation emails are sent to the email address entered during checkout. Confirmation Screen Sample: The confirmation screen appears at the end of the checkout process. I redeemed a code. Why can’t I access my course assignments? 1. Has the code expired? If you have been using the code for a while, it is possible that the code expired, in which case you will need to purchase a new code. Visit our online Store to purchase a code with instant e-Delivery, vistahigherlearning.com/students/store. 2. Does the code have the proper access privileges? If you are unable to access your course, an activity, or an assignment, chances are that the code you redeemed did not provide sufficient privileges. Confirm that your code corresponds with the access level required for the course (you may need to ask your instructor). If you need an upgrade code or a new code, visit our online Store to purchase a code with instant e-Delivery, vistahigherlearning.com/students/store. 3. Is the code for the correct book? Confirm that the code is for the correct textbook (edition number makes a difference). 4. Did you enroll in your instructor’s course? Even if you redeemed a code, if you don’t enroll in your instructor’s course, you will not be able to see assignment due dates. Learn how to by reading FAQ: How do I enroll in my instructor’s course? How can I buy a code? New codes may be purchased at the Vista Higher Learning online Store at vistahigherlearning.com/students/store. Why is the site saying that my code does not meet the course requirements? If you are unable to access your instructor’s course, an activity, or an assignment, chances are the code you redeemed does not provide sufficient privileges. Confirm that your code corresponds with the access level required for the course (you may need to ask your instructor). If you need an upgrade code or a new code, visit our online Store to purchase a code with instant e-Delivery, vistahigherlearning.com/students/store. Can I use the same code for two simultaneous classes? No. You may only be enrolled in one course at a time per code. If you need to be enrolled in two courses at the same time for the same textbook, you must use two separate accounts and redeem a code in each account. 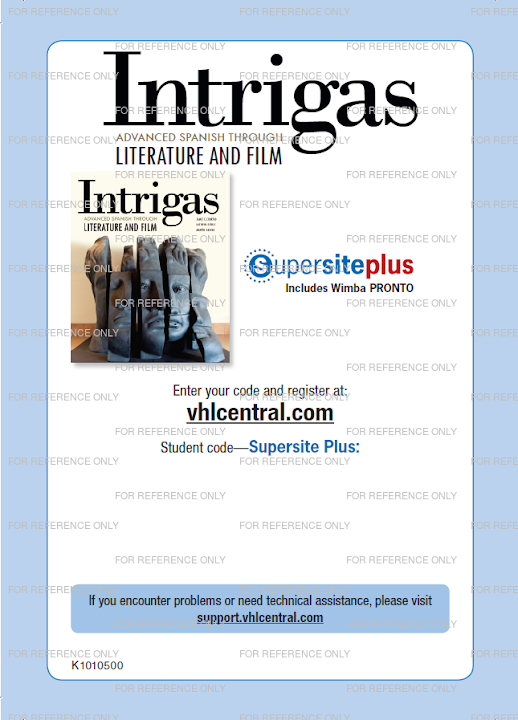 Additional codes may be purchased at the Vista Higher Learning online Store at vistahigherlearning.com/students/store. I bought the wrong code. Can I exchange it or get a refund? If you purchased a textbook package or a Supersite code at your school’s bookstore or another online retailer, please contact the bookstore or the online retailer regarding their return policy. If you purchased a package that included a printed textbook or an access code, refer to the "Returns" section, Frequently Asked Questions (FAQs) and read: "How do I return my textbook package?" What is the cost of a new code? I bought a code on the Store, but never received it. Where is it? If you purchased a code from our online Store, the code may have been automatically redeemed during checkout. Try logging into www.vhlcentral.com using the username and password you entered during checkout. Do you have two accounts? Sometimes users create more than one account and log into the account that does not have Supersite access. If you aren’t sure if you have another account, you can chat with a technical support agent. Technical support agents will need your code letters, the name of the book, your name (as it was entered when creating the account), and the username or email address for your account in order to conduct a search. I bought a used book. Can I use the code in the book? Codes cannot be used more than once or transferred to another user. If the code was used by the previous owner of the book, you will need to purchase a new code. Visit our online Store to purchase a new code with instant e-Delivery, vistahigherlearning.com/students/store. I purchased a code online, but did't get a confirmation e-mail or the code. Where is it? 1. 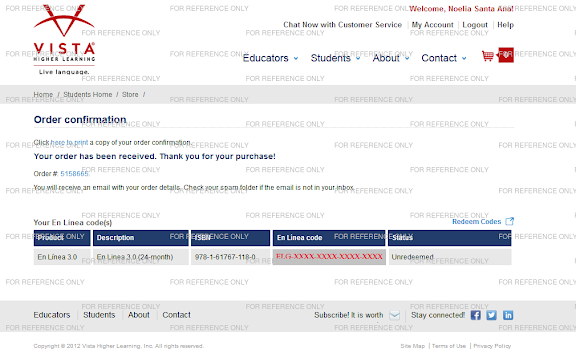 After completing checkout via our online Store (vistahigherlearning.com/students/store), a confirmation page containing your code appears and a confirmation email is sent to the email address provided during checkout. Please check the Junk or Spam folder in your email account. 2. If you are unable to find the confirmation email, customer service can resend it. They will need the name and email address of the person who placed the order, the date of the order, and details about the item(s) ordered (please do not send any credit card information).